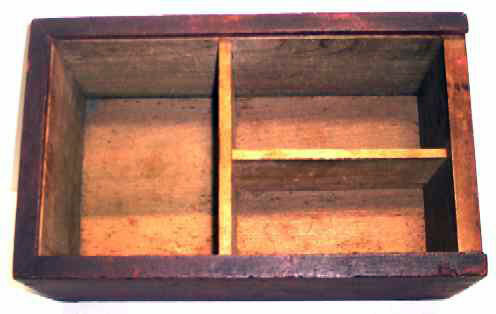 Presented here, a wonderful slide lid box with divided interior. Hand made from pine and poplar with dovetailed corners. The slide lid is chamfered on three sides to fit the box. The bottom is attached with tiny square nails. The lid is notched. 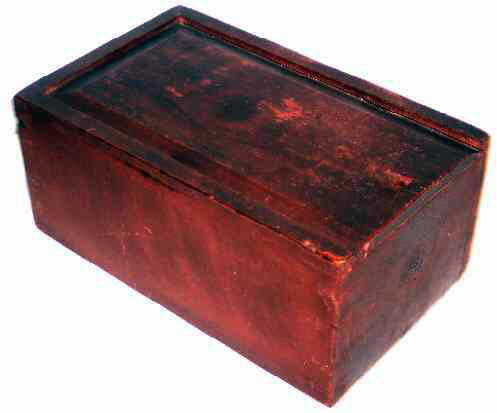 This box displays a fantastic surface and history of use. The paint is 100% original and untouched. A second, thicker coat was applied over the base coat and this top coat shows thick wavy brush strokes that end in curlique circles in two places . . . on the top and on the front. It looks like a knot but it's not. Sorry, but I had to say that! 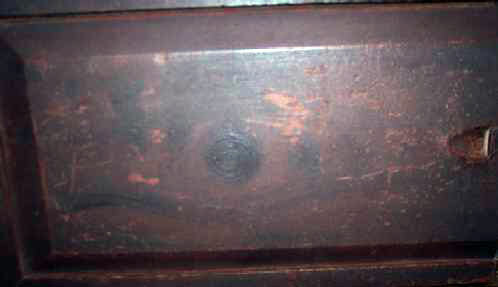 There is honest wear and patina to the end of the slide lid on the underside from use. And what a surface! Dry and crusty yet displaying the proper patina from being handled. An almost impossible combination to find. 12" long x 5 1/2" tall x 7 1/2" wide. This box is in outstanding condition and has obviously been well taken care of. The divided interior would lend itself to many uses. The strength of the color is its outstanding feature and unlike the photos, the color is really not a bright red, but more of a barn red. Lovely! The texturized surface is a nice, understated, decorative element.